Roberto Sanchis-Ojeda from MIT and his research colleagues have discovered a solar system similar to our own only 10,000 light years away. It is the first exoplanetary system with planets in aligned orbits around a central star, which is as big and just as bright as the sun. 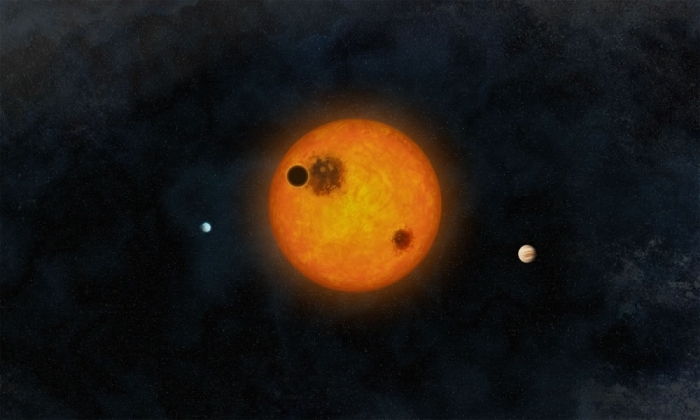 Three planets orbit the central sun-like star, which has been named Kepler-30c, after NASA's Kepler space telescope. Our own planets formed from a spinning disc of matter, and guess what? We don't actually know, but the trajectory of the three planets is also parallel to the rotation of their star, just like the planets in our solar system. The journal Nature publishes this paper explaining how our own system evolved and how far-flung galaxies and systems operate. As this alien system has no hot gas planet like Jupiter this might provide evidence as to why our own hot planet is orbiting off-centre. The researchers checked the Kepler space telescope data to discover that three longer orbits than Jupiter formed the planets' trajectories. So our own slightly different hot "Jupiter-style system may have formed with planetary scattering. Some may even have been lost completely. There are several hot Jupiter systems like our own, with tilted orbits. This new system has planets further from their star with little orbital tilt. That means that systems like ours could be misaligned because of the volatile early jostling of hot gas planets. We are very close to our Sun compared to this system and that is the number one factor governing the evolution of life. This first study of the alignment of a non-hot Jupiter system suggests that hot Jupiter systems form via planetary scattering. To know for sure, Drs. Winn and Sanchis-Ojeda plan to measure the orbits of other distant systems, collaborating again with the University of California at Santa Cruz and others. "We've been hungry for one like this, where it's not exactly like the solar system, but at least it's more normal, where the planets and the star are aligned with each other," Josh Winn of MIT says. "It's the first case where we can say that, besides the solar system." Any suggestions for naming the three planets?